Last Wednesday I headed into a writing retreat. I popped back out into the world Sunday afternoon feeling satisfied with the time I spent with myself, exploring our evolutionary relationship with cities and the reasons for whichI am compelled to do this work. Strawberry Creek Lodge is in a beautiful setting in aspen parkland – full of the genus populus, after which my company is named. I love to spend time outside, so I took my tent and set up camp on the edge of a meadow, on a bluff overlooking strawberry creek a hundred feet below. The view from my tent was impeded by the forest growth crawling up the bank. Yet despite the visual obstacle, I knew what was on the other side – a beautiful view. I learned that I need a good night’s sleep in order to be able think and write clearly. In the end, I spent only two nights in the tent, bookending the summer solstice. I learned that while I am writing, it is absolutely critical for me to have a good night’s sleep. Waking up at 4:40 am and working from 5-8am before breakfast and then being so tired to have to sleep until noon is not a recipe for success with my body. Sleep in split shifts is not helpful. 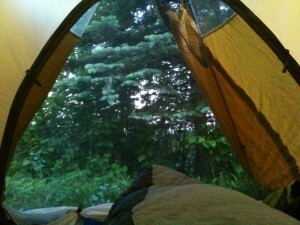 I chose then to sleep in my room in the lodge and make treks out to my tent to think about my writing. It feels good to just sit and write. it was a great way to mark the transition into summertime. I completed and submitted my book proposal to New Society Publishers. I have organized a bit of a ‘plot’ to guide the next series of posts on evolutionary intelligence. In July, I will introduce the intelligences for the city articulated by Marilyn Hamilton (Integral City). In September, my blogging time will be consumed by my participation in the Integral City eLaboratory, an online conference. You can expect many more details on evolutionary intelligences for the city. Over the course of August, I will tease out the principles and practices that specifically create the conditions for a social habitat that allows for us to integrate our economic life with our physical habitat. A Nest City Manifesto is coming. As I conclude the first piece of this book that has a hold of me, I am preparing a 30 page ‘report’ to share with readers. I will share this freely (literally) with readers in the fall of 2012. I have updated some of the text on my website. I have some things to keep adjusting, but I have recognized that it may be time for a refresh of the whole thing. The truth is, I am not sure what needs to be done on this front. Comments welcome! I have rearticulated my business plan and how I wish to spend my time – in my personal and work life – in support of writing and exploring our evolutionary relationship with cities. Thanks for reading – I appreciate this opportunity to share what I am thinking, finding and writing with all of you. Here are two great blogs that have shaped several decisions over the last few months: Chris Guillebeau’s unconventional strategies for life, work and travel, and Nina Amir’s How to blog a book. Enjoy! 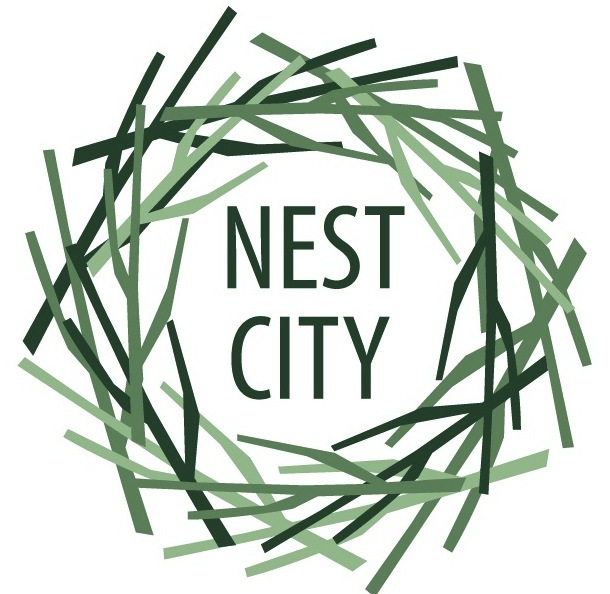 Just over two weeks ago I wrote about my decision to slowly release my book, Nest City: The Human Drive to Thrive in Cities, as a blog. Part of that decision was to post a piece of the book Monday, Tuesday, Wednesday and Thursday each week, starting Tuesday May 1, 2012. I have done it for two weeks. Phew. Even though I have material written, it has taken a lot of time and focus to turn what I have into a blog post that is remotely cogent and meaningful. It has been useful to condense my thinking. Most helpful is the insight not to name the post until I am just about done – at that point I seem to find the point of the post. A compelling title. It might be all a readers sees in an RSS feed. It will also be part of an attractive collection of posts as they become more numerous. The title itself can be insightful. A compelling first sentence. This appears on LinkedIn and facebook, for example. It must draw readers in. A compelling personal update. The title can be used, or slightly modified, for a Twitter/LinkedIn/facebook update. The words themselves are what will compel a follower to retweet or forward my update and link. A post that provides links to others’ work. As I explore, it is important for me to notice, for myself and others, the work on which I am building. This models how economic life works. Writing what is wanting to emerge from me. I trust that each of us has a passion that is worth following. Being part of our cities’ feedback system. As a writer, my work is, in part, to reflect on cities and how we organize ourselves. I share what I see. I have to confess I am looking forward to a break from blogging for a couple days. But I know I will be itching to post again on Monday. The pressure is welcome. Nest City: the Human Drive to Thrive in Cities is the title of the book I have been working on now for a few years. I have 100,000 words that now sit in a structure that makes sense. I know where it is going and my ask now is to make it clear and compelling. I have very purposefully over the last 9 months chosen not to blog very often; it seemed to be a distraction from the writing time I need for the book. The signal: Agent rejection #1. My first proposal to a literary agent was declined. This is normal, but it made me rethink the traditional “publishing” trajectory of finding an agent, who finds an editor who wants to publish your work, and so on. This serial world is at odds with the messy and meshy world that I live in. Response: Diversify my efforts to find my audience. Signal: I keep reading about small publishers. My goal is to put my material out into the world. Once out there, it will grow if it is meant to grow. While it would be a thrill for my ego if my writing went viral, the reason I am writing is to find and support people who are working to create cities to be the best habitat they can be for as many people as possible. Response: Just start small. Signal: Writing about blogging keeps coming my way. The Writer’s Guild of Alberta‘s most recent edition of WestWord has an article on blogging. My takeaway: blogging time feeds other writing time. Response: It is time to blog and put my ideas out there. Signal: People want to read Nest City. After one of my sessions at the Manitoba Planning Conference this year, a participant asked me where she could get my book. I had no answer and no way to connect people to my work. I am being asked to very explicitly put my work out into the world. I do not need to wait for a book to be published to do this. Response: It is time to share what I’ve got and invite feedback. SO. I intend to release my work here. Each Tuesday, in short little pieces, I will release the pent up energy that is vibrating in my whole being. It will be a slow release… to feed our capacities to build cities in which we nest and from which we go on great adventures.